It had to be seen to be believed. Looking like something out of a Sci-Fi blockbuster, Flyboard Air inventor Franky Zapata piloted his creation 2,253 meters to smash the world record for the farthest distance traveled by hoverboard, which previously stood at 276 meters. Zapata made the incredible flight over the harbor of Sausset-les-Pins, in the south of France, supported by two all-new Ford Ranger Wildtrak pickups. Taking four years to design, develop and perfect, the jet-propelled hoverboard flew at an average 55 km/h, and a top speed 70 km/h to cover the distance in three minutes. “Ford is always looking for new ways of doing things so it's no surprise that we'd partner with Franky for his record attempt with the Ford Ranger. 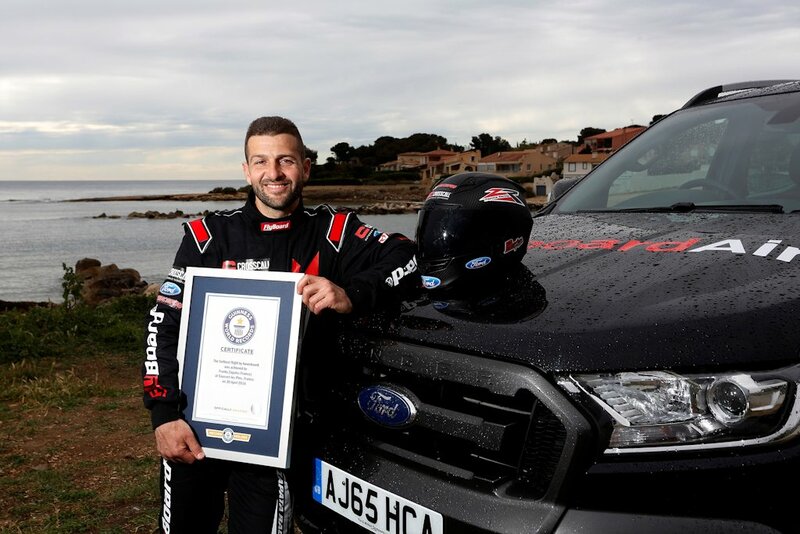 It's a really exciting time to be supporting innovations that explore different ways of getting around in future and it's great to see the record broken so convincingly,” said Mark Truby, vice president, Communications & Public Affairs, Ford of Europe. Do you want to buy an electric balance board? All offers Self Balancing Boards throughout the Netherlands in one easy overview and updated daily. Top brands such as Airboard, Cyboard, Esway, Future Foot, Galactic Wheels, IO Hawk Board Mono, Mono Rover, Oxboard, Phunkee Duck, Swagboard and many other electric self-balancing boards on two wheels. I wonder how they are going to class the hoverboard! There is no shortage of people who are eager to get their hands on one of those no matter what the finances involved in doing that!